Unlike its predecessor, ‘The Barn Dance‘, ‘The Opry House’ relies heavily on sound and music. Mickey is the sole performer in a local theater where he dances and plays music. He even dresses up as a female belly dancer, dancing the hoochie coochie dance. With its many musical gags, this cartoon is the first step in the development of the ‘concert cartoon’. An orchestra plays George Bizet’s Carmen way out of tune, and Mickey performs the Hungarian Rhapsody by Franz Liszt on the piano. 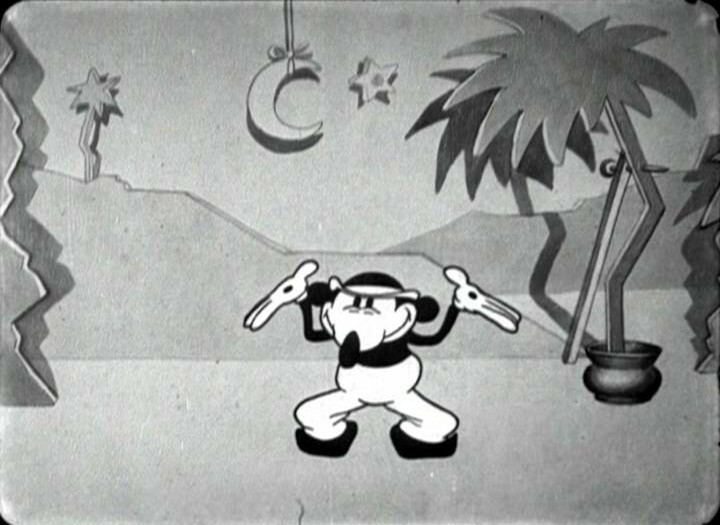 This sequence is particularly important for two reasons: first, Mickey here gains his famous gloves, and second, this is the first time that Liszt’s famous work is featured in an animated cartoon. It would remain a cartoon classic and many years later, Bugs Bunny would perform the same piece on the piano in ‘Rhapsody Rabbit‘ (1946), and Tom and Jerry in ‘The Cat Concerto‘ (1947). Already in this cartoon, Liszt’s piece is the source of several musical gags, as Mickey plays the piano in the most original ways, even clobbering it with his fists, until his stool kicks him.